"I urge you once again, now for the third time in writing, to turn over the therapy notes, polygraph materials, and communications with The Washington Post that Dr. Ford has relied upon as evidence," he wrote in the Oct. 4 letter to Ford’s attorneys Debra Katz, Michael Bromwich, and Lisa Banks. “In addition to the evidence I requested in my October 2 letter,” he continued, “in light of recently uncovered information, please turn over records and descriptions of direct or indirect communications between Dr. Ford or her representatives and any of the following: (1) U.S. Senators or their staffs, particularly the offices of Senators Feinstein and Hirono, other than your communications with me and my staff in preparation for the September 27 hearings; (2) the alleged witnesses identified by Dr. Ford (Leland Keyser, Mark Judge, and Patrick “P.J.” Smyth); and (3) Debbie Ramirez, Julie Swetnick, or their representatives." Grassley did not expand on what he meant by “recently uncovered information,” and the FBI’s supplementary background investigation of Judge Brett Kavanaugh has not been released in full (Grassley’s staff did publish an executive summary you can read here). Ford testified to the Senate Judiciary Committee last week that Feinstein’s office recommended the law firm Katz, Marshall & Banks, LLP, before she went public with her allegation of an early-1980s assault. Two members of the firm Feinstein’s office recommended, Debra Katz and Lisa Banks, represent Ford. Her third attorney, Michael Bromwich, also represents fired FBI Deputy Director Andrew McCabe. 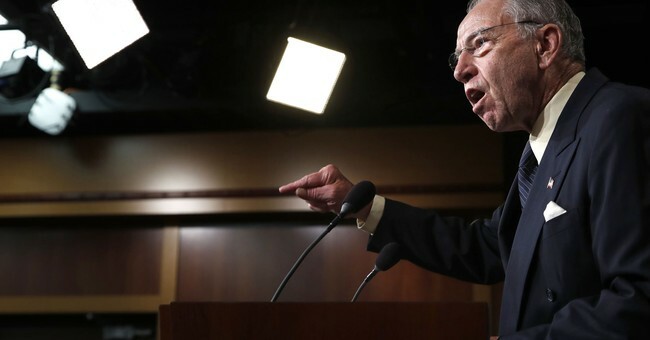 On "Fox and Friends" Friday morning Grassley alluded to uncovered information, which he said was in the confidential FBI report, as another example of "headquarters for the resistance being right here on Capitol Hill."